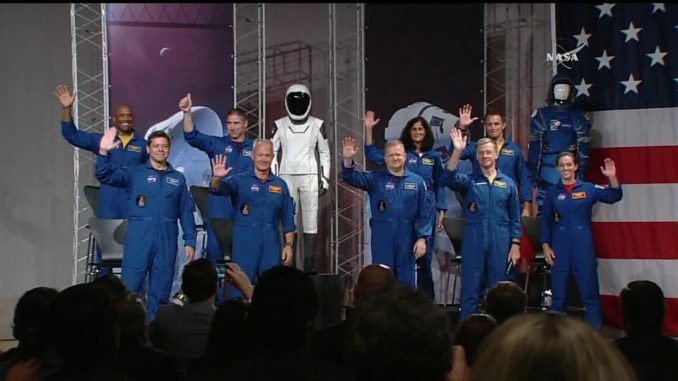 In a ceremony at NASA’s Johnson Space Center in Houston, the space agency revealed nine astronauts assigned to the first four crewed flights of Boeing’s CST-100 Starliner and SpaceX’s Crew Dragon capsules. “For the first time since 2011, we are on the brink of launching American astronauts on American rockets from American soil,” said NASA Administrator Jim Bridenstine. Former shuttle commander Chris Ferguson, who helmed the final flight of the shuttle Atlantis in 2011, will be on a three-person crew aboard the first piloted mission of Boeing’s CST-100 Starliner capsule. Ferguson, now a Boeing employee, will be joined by veteran shuttle pilot Eric Boe and rookie astronaut Nicole Mann on the CST-100’s Crew Test Flight, scheduled for liftoff in May 2019. 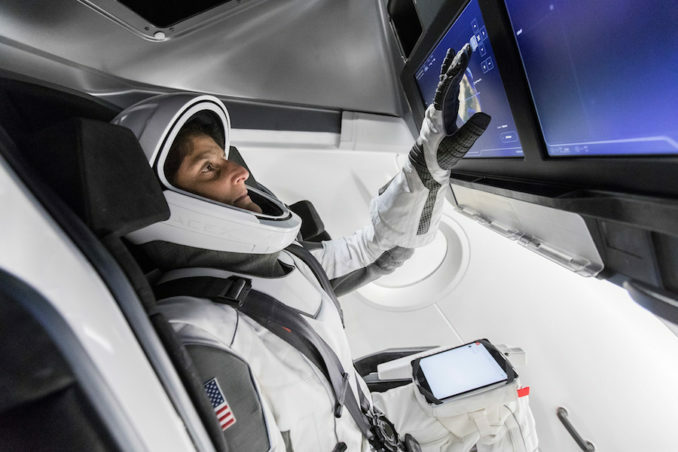 A two-man team of NASA astronauts will ride SpaceX’s Crew Dragon into orbit on its first crewed test flight, targeted for launch in April 2019. NASA astronaut Bob Behnken, an experienced spacewalker who flew on two shuttle missions, will strap into the Crew Dragon alongside former shuttle pilot Doug Hurley. Both capsules will fly to the International Space Station on their first crewed test flights, blazing a trail for future crews to ride to and from the orbiting research complex on operational crew rotation missions, ending NASA’s sole reliance on Russian Soyuz spacecraft for the job. 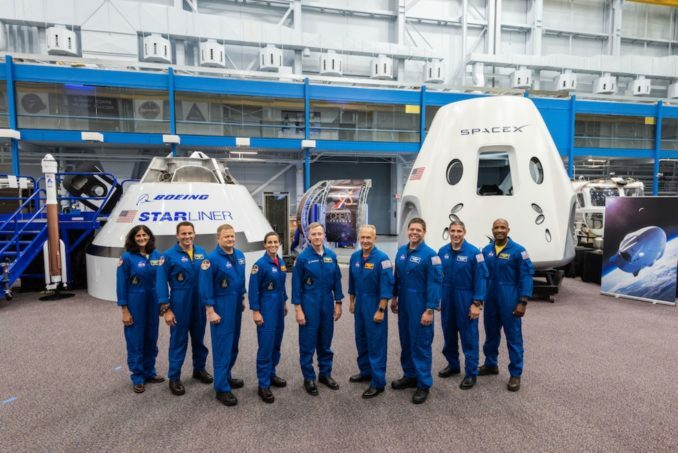 NASA also unveiled part of the crews who will ride the CST-100 and Crew Dragon’s first regular crew rotation flights, called “post-certification” missions by the space agency and its contractors. 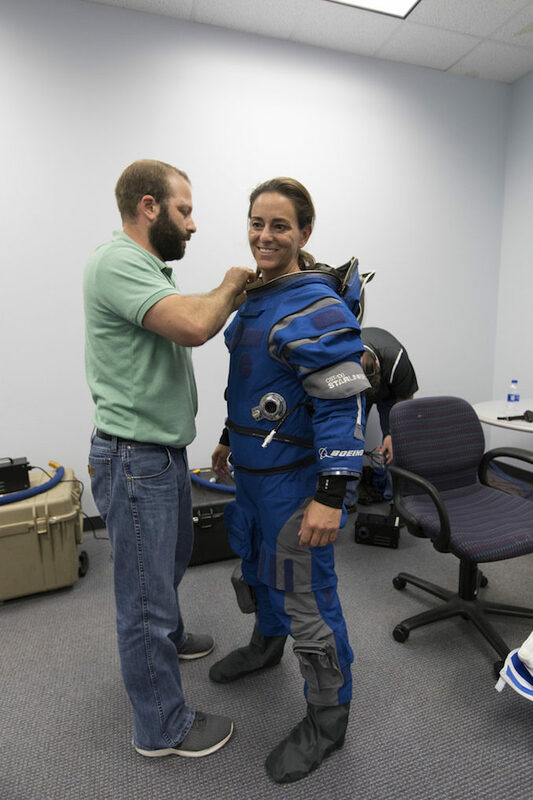 On Boeing’s first post-certification mission, NASA astronaut Suni Williams, who has flown on the space station two times already, will fly to the outpost again with first-time space flier Josh Cassada. 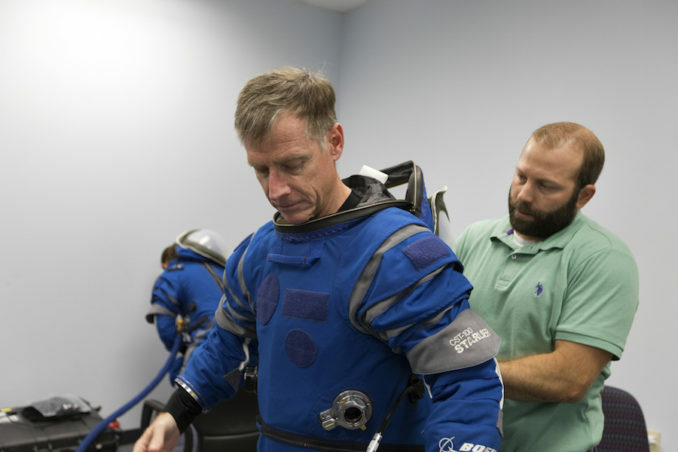 Veteran station flight engineer Mike Hopkins will be accompanied by rookie astronaut Victor Glover on the Crew Dragon’s first operational flight to the station. NASA has not announced which astronauts will command each CST-100 and Crew Dragon flight. NASA’s partners on the International Space Station program — the Russian space agency Roscosmos, the European Space Agency, the Japan Aerospace Exploration Agency, and the Canadian Space Agency — are expected to assign members of their own astronaut corps to the CST-100 and Crew Dragon crew rotation flights. The space agency says each post-certification flight by the CST-100 Starliner and Crew Dragon spacecraft will carry four passengers on half-year expeditions to the space station. Boeing and Space Adventures, the U.S. company that arranged space tourist flights on Russian Soyuz spacecraft, have a partnership that could allow paying passengers to ride in a fifth seat on CST-100 missions for shorter-duration missions. Under the Obama administration, NASA decided to turn over responsibility for carrying astronauts to and from low Earth orbit to the private sector after the retirement of the space shuttle in 2011. The agency selected Boeing and SpaceX for the task in 2014, awarding contracts to each company valued at $4.2 billion and $2.6 billion, respectively. Originally designed in the 1970s, with upgrades added through the following three decades, the space shuttle was part-crew carrier, part-cargo truck. The new-generation commercial vehicles supporting the space station come in two versions, with SpaceX and Northrop Grumman providing cargo services, and SpaceX and Boeing carrying astronauts. “The space shuttle, I think what we’ve really discovered, at least in my part over the last three or four years working in commercial crew, was that vehicle was really capable, and it’s super-hard to dupicate it in the short period of time we’ve had,” Behnken said Friday. “It had decades to kind of mature to where it was when we got our chance to fly it. “It’s hard to kind of create a vehicle that accomplishes what that vehicle did so wonderfully and so majestically,” Behnken said. While they lack the size and lift capacity of the shuttle, but the new commercial ships benefit from numerous advancements in technology, and they are both designed to be safer — and less expensive — than the shuttle. 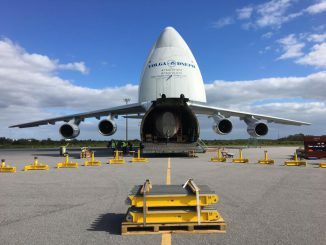 Boeing’s capsules will launch aboard United Launch Alliance Atlas 5 rockets from Cape Canaveral, dock with the International Space Station for stays of up seven months, and return to Earth for landings in the Western United States with the aid of parachutes and airbags. Built to the same basic NASA requirements, SpaceX’s Crew Dragon vehicles will launch from pad 39A at the Kennedy Space Center, a former shuttle launch facility, on the company’s own Falcon 9 rockets, then return to parachute-assisted splashdowns at sea. Hurley, also a Marine Corps fighter pilot-turned-astronaut, said test pilots dream of taking a new vehicle into the sky for the first time. NASA announced updated schedules for the first CST-100 Starliner and Crew Dragon test flights Thursday. SpaceX’s Crew Dragon spacecraft is now expected to make its first unpiloted test flight in Earth orbit in November, followed by the crewed test flight in April 2019. The CST-100 Starliner’s first demo mission is scheduled for early 2019, likely in January, followed four or five months later by the crewed demo flight. 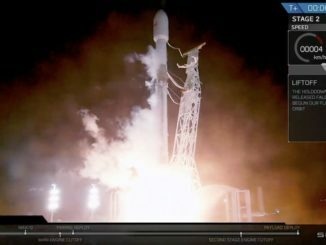 Those target dates are several months later than NASA previously disclosed, as Boeing struggles with an abort engine problem encountered during a ground test in June, and SpaceX preps a Crew Dragon capsule and a Falcon 9 rocket with redesigned helium pressurant tanks, designed as a permanent fix for the cause of a rocket explosion on a SpaceX launch pad in 2016. NASA and Boeing have agreed to potentially use the CST-100 Starliner’s crewed test flight, which originally was supposed to launch with a Boeing test pilot and a NASA astronaut, to carry a passenger who would stay aboard the space station for a long-duration months-long stay. If NASA chooses to exercise that option, the CST-100 test pilots could help ensure the station has a U.S. astronaut on-board after the space agency’s agreement with the Russian government for Soyuz crew seats expires. The Russian space agency — Roscosmos — and NASA have agreed to extend the length of upcoming space station expeditions to more than six months. That will allow NASA’s contract for astronauts seats on Russian Soyuz spacecraft to cover crew returns through at least January 2020, several months later than originally planned. These measures are aimed at reducing the risk of a gap in U.S. crew access to the space station after NASA’s contract with Roscosmos for Soyuz crew seats expires. 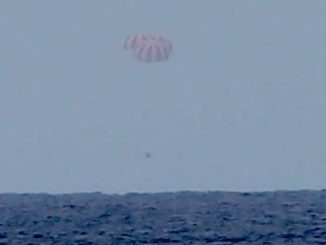 Once the U.S.-built commercial capsules are flying, all Crew Dragon and CST-100 missions will fly with a Russian cosmonaut and all Soyuz flights will launch with a NASA flight engineer, ensuring critical U.S. and Russian systems on the space station can always be operated by a proficient crew member. The “in-kind” agreement between NASA and Roscosmos will not involve any exchange of funds.